Who should avoid glycolic acid? Glycolic acid is the smallest of the alpha-hydroxy chemical compounds. It is used to treat common skin concerns by exfoliating dead cells that accumulate on the surface of the epidermis. The American Academy of Dermatology recommends that consumers determine their skin type before adding glycolic acid to their beauty regimen. Glycolic acid is the smallest of the alpha-hydroxy acids (AHA). It is derived from sugar cane and is used as a tanning and dyeing agent in the textile industry, a preservative and flavoring additive in food, and a skin care ingredient in cosmetic products. Its tiny molecular size gives it the unique ability to penetrate deeper into the skin than other alpha-hydroxy acids. Glycolic acid addresses skin issues by exfoliating dead skin cells that accumulate on the surface of the epidermis and contribute to dull, discolored, and uneven looking skin. By penetrating deep into the epidermis, glycolic acid triggers collagen production. “Healthy collagen is good for keeping your skin elastic, preventing wrinkles, and making your skin appear younger and firmer,” Dr. Buka explains. You are taking or have recently stopped using the acne medication Isotretinoin, formerly known as Accutane. You have recently had a microdermabrasion treatment. You are a frequent user of sunbeds or are regularly exposed to the sun without adequate protection. An excellent way to test your skin’s tolerance to a product is to apply a tiny dab of the gel or cream onto a small area of your skin and analyze your skin’s response. A tingling sensation is a sign that the hydroxy acid molecules are penetrating the dermis. However, if your skin starts to sting and turn red, you should opt for a product with a lower concentration of glycolic acid. Just bear in mind that you need to carefully monitor your skin’s reactions during the first few weeks after you start using a product with glycolic acid. If you notice redness or sense irritation, it may be a sign that you need to reduce the frequency of application from, for instance, daily to twice or three times a week. However, should the opposite be the case, and your skin no longer experiences any tingling sensations, an increase in the application frequency may be required. It’s important to remember that the amount of exfoliation depends upon the quantity and type of glycolic acid, as well as whatever other ingredients are included in the product. Stinging and burning are common side-effects, especially when the concentration of glycolic acid is stronger than what your skin can tolerate. Crusting, scabbing, and flaking can also occur. In rare cases, temporary discoloration of the skin is possible. Testing by the FDA found that a person’s sensitivity to the sun and ultraviolet light increased by 18% after they used a product containing glycolic acid for four weeks. Consequently, it’s recommended that a quality sunscreen accompany the use of alpha-hydroxy cosmetics. The following is a list of five reputable products containing glycolic acid. Regardless of your skin type, there is something here for everyone. FAB Facial Radiance Pads are gentle enough for daily use. Cucumber and Indian gooseberry tone your skin, while lemon peel and licorice root ensure your skin is glowing. 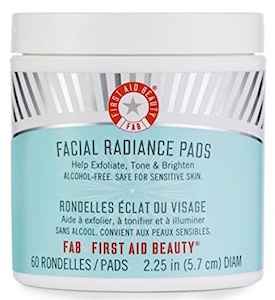 FAB’s facial radiance pads are free of preservatives, harsh chemicals, and colorants. Paula’s Choice Skin Perfecting 8% AHA Gel contains 8% glycolic acid, cooling aloe vera, and tea extract to soothe and moisturize skin. This unique AHA gel exfoliant promises to remove built-up layers of dead skin, revitalize uneven skin tone, and smooth away the appearance of wrinkles. Paula’s Choice Skin Perfecting Gel combines the exfoliating benefits of glycolic acid with long-lasting hydration that can dramatically improve the smoothness of your skin. 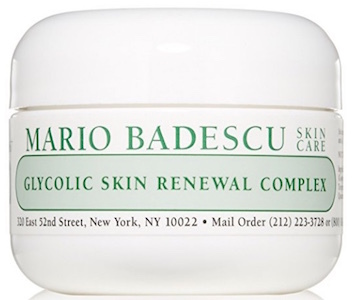 If you have dry skin, Mario Badescu Glycolic Skin Renewal Complex is a gentle exfoliator that combines the power of an intense hydrating cream with the resurfacing power of glycolic acid. The ingredients also include papaya extract and vitamin A, helping to reveal a more radiant youthful complexion. If your skin is acne-prone or oily, Vichy Normaderm Anti-Aging Resurfacing Moisturizer with Vitamin C might be right for you. It’s not sticky, and it can soften a shiny complexion. It also unblocks pores, exfoliates dead skin, kills acne-causing bacteria, and stimulates skin renewal. Dermatological ingredients include glycolic acid and LHA (salicylic acid). Its non-greasy, ultra-penetrating texture not only cleans but also soothes and hydrates skin. If you haven’t had any experience with glycolic acid, an excellent starting point is Epicuren Discovery Glycolic Lotion Face Peel 5%. Due to the low concentration of glycolic acid, this skin peel is suitable for sensitive skin types because the chances of flaking and irritation are low. The consistency of this product is milky white and mild, and the lotion boosts skin cell turnover that helps reveal a smoother and more vibrant complexion. That means beginning with a low concentration of glycolic acid and working your way up. If you have any concerns or questions, don’t hesitate to make an appointment with a dermatologist who can help you make an informed decision about which glycolic acid treatment is right for your skin type. »To find out more about glycolic acid and other skin exfoliation treatments, use Zwivel’s online directory to search for cosmetic doctors in your area.